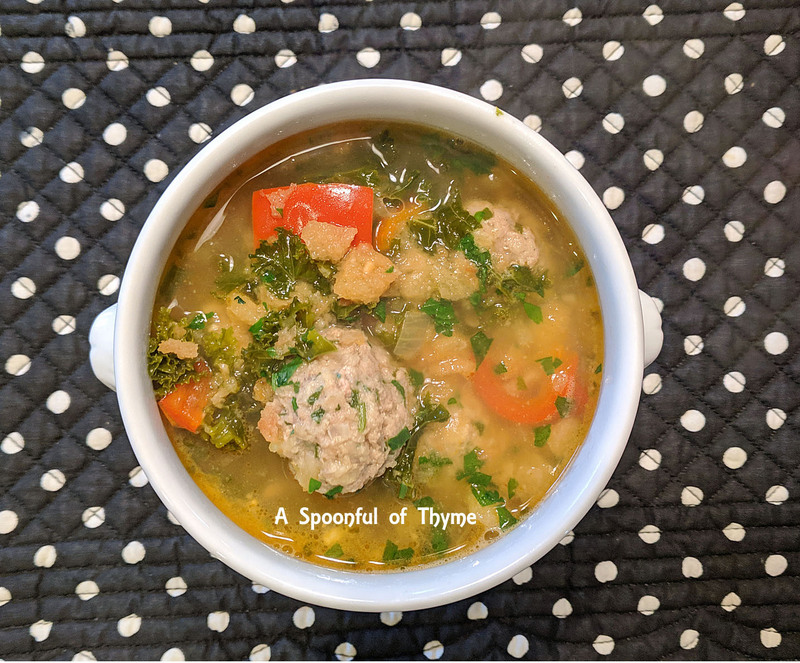 Today is Saturday Soup Swappers and today's challenge was to make a soup with meatballs! This was a super fun challenge. Why? Because I love meatballs!! 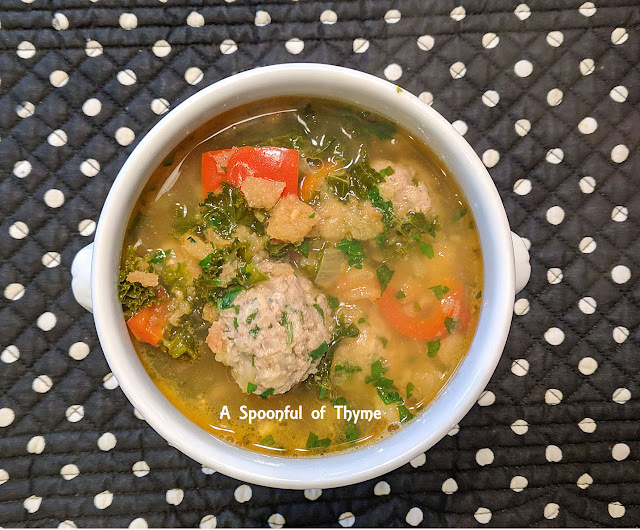 Since childhood I have leaned toward a dish that features meatballs...I have even been known to eat lamb meatballs and if you know me well, you know that lamb rates at the bottom of my list of favorites. Bring on the Spaghetti and Meatballs, bring on the Italian Wedding Soup. I will always have a fork and spoon ready! Today's soup features turkey meatballs and kale with a lovely picada mixed in just before serving. Picada originated in the Catalan region of Spain around the thirteenth or fourteenth century as a way of thickening a soup or stew. It is a combination of ground nuts, bread crumbs, aromatics and olive oil that when mixed together thickens a dish and provides a "tah dah" to the dish! Saffron is the star of this soup. It has a lovely subtle flavor that you know when you taste it. Paella isn't paella without saffron! Bouillabaisse isn't bouillabaisse without saffron! And, this Spanish-style soup wouldn't be nearly as tasty without it! There really isn't a substitute for saffron. It is expensive and if you are lucky enough to be traveling in Spain you can easily find it in the market. Saffron is the dried orange-red stigma of a crocus sativas a sterile crocus used specifically for the purpose of its three stigmas! Yes, three. Three per flower. And, they are hand-harvested! You can see why the expense. There are 70,000 flowers harvested for one pound of saffron! Pulse the nuts in a food processor to fine crumbs. Add the bread, olive oil, salt and pepper and continue to pulse the bread to coarse crumbs. Spread the mixture over a baking sheet. Toast, stir frequently, until golden brown. (Ten minutes) Let cool. The picada may be made in advance and stored in an airtight container for two days. In a large bowl, mash the bread and milk together into a paste. Add the ground turkey, Manchego cheese, parsley, shallot, oil, salt and pepper. Mix the combination thoroughly. When combined, roll the meatballs by pulling off about 2 teaspoons of meat mixture. Roll into firm balls and place on a rimmed baking sheet. Cover with plastic wrap and refrigerator until firm, about 45 minutes. In a large Dutch oven, heat the oil until shimmering. Add the onion and bell pepper. Cook until softened and lightly browned. 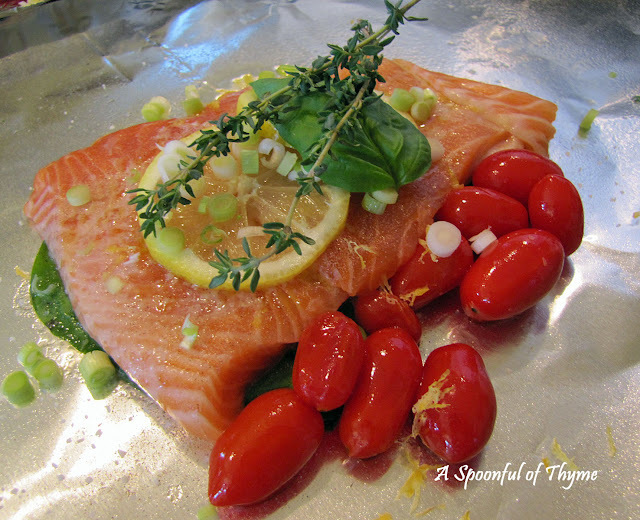 (10-12 minutes) Stir in the garlic, paprika, saffron, and red pepper flakes. Cook, stirring, until fragrant, about 30 seconds. Stir in the wine, scraping up any browned bits. Cook until almost evaporated, about 2 minutes. Stir in the broth and bring the soup to a simmer. Gently add the meatballs and kale. Continue to simmer until the meatballs are cooked through 12-15 minutes. Off the heat, stir in the picada, parsley, and season to taste with salt and pepper. Your meatballs sound delicious with that manchego, and I love anything saffron! Thank you, Karen! The cheese really have the meatballs a great touch of flavor. I can just about smell that soup. It looks so amazingly delicious. Thank you, Wendy, I was really excited about this recipe. Super tasty. We both made turkey meatballs this month. :) Your soup sounds like something you'd order in a fancy restaurant, and looks delicious. Thank you, April. Yes, turkey seemed to be perfect, especially with the white wine! This looks divine. I've passed it along to my girls and sister. The four of us are about to put together a Soup Blog. Oh Annis, that will be fun! Love the addition of saffron in the soup, gives the soup a warm color, look delicious. 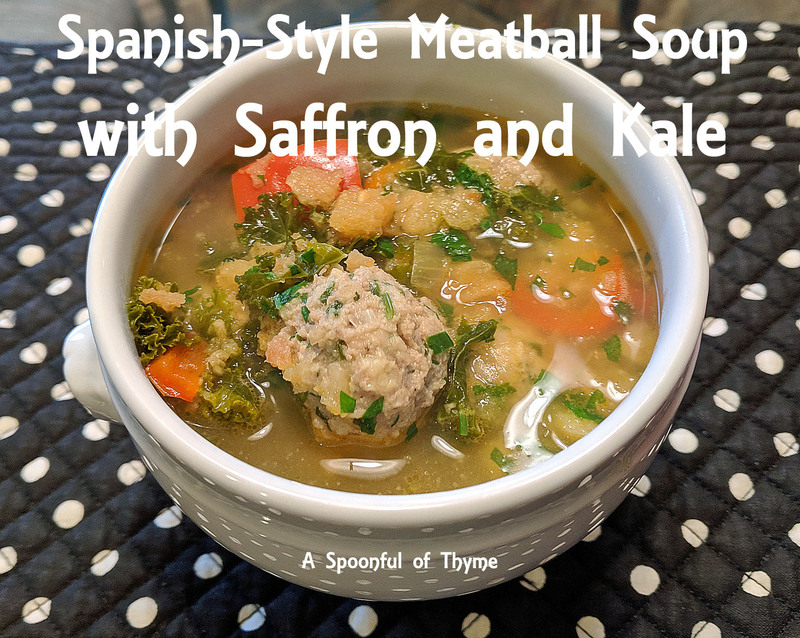 Spanish-Style Meatball Soup is exactly what I was missing in my life, ha-ha :) I love soups and I'll give this recipe a go next dinner.